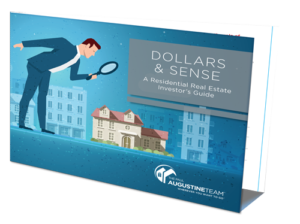 Whether you want just a quick flip or to add to your portfolio of long-term investment properties, you can rely on The Paul Augustine Team’s pragmatism to guide you toward sound, responsible real estate investment decisions. Our role is to help you identify properties that will help you achieve your strategic investment objectives. Continuous Communication: Based on your preference, we’ll call, email or text you at least once per week to discuss progress, review any changes to your circumstances and market conditions, and ensure we’re meeting your expectations. Home Pro Network: Enjoy access to The Paul Augustine Team’s network of qualified home professionals including home inspectors, movers, mortgage professionals, handymen, general contractors, plumbers and electricians. We’re available to consult with you about and resolve all your property concerns. Thinking of making a Real Estate investment? Schedule a complimentary consultation with one of our experts. Don't let the TV fool you: Like buying stocks in a company, investing in real estate takes skill, foresight and creativity. To succeed in the business of residential real estate, it's important to select a realty partner who can check every box: area natives, respected local experts, holistic approach. The Paul Augustine team is comprised of lifelong residents of Bucks and Montgomery County; over a decade-plus, we've amassed a proprietary arsenal of local real estate intelligence, with a foundation in home renovation and construction. Combined, these qualities allow us to understand what the market—whether potential buyers, or future tenants—want in a property, and help you maximize upside potential. At the Paul Augustine Team, we believe that success is only possible because of Exceptional Service and Continuous Communication. That’s why we guarantee you’ll always know exactly where you are on the path to buying or selling. If, at any time during your relationship with us, you aren’t completely satisfied that we’ve met that standard, simply let us know, and we’ll either correct the issue to your satisfaction or release you from any further obligations to our service. © 2005-2017 Paul Augustine Team. All rights reserved.